LJUBLJANA, Slovenia – RTV Slovenia (Radio-Television Slovenia), the country’s public, non-profit radio and television broadcaster, has commissioned two radio OB trucks for musical recordings, equipped with Studer Vista 5 digital consoles. Supplied by Studer’s local distributors, AVC Group, the turnkey installation was overseen by the company’s subsidiary system integration operation, TSE. Both AVC and TSE have enjoyed a close relationship with RTV Slovenia stretching back 15 years, although procurement still had to be implemented through public tender. RTV Slovenia has a long history of using Studer platforms — particularly Radio Slovenia in Ljubljana with both regional centres in Koper and Maribor mainly equipped with Studer radio consoles (OnAir 1000, OnAir 2000, OnAir 2500 and OnAir 3000), and Studer Route 5000 routers. The new OB trucks will principally be used for transmission and recording of live concerts up to 64 channels (via MADI). However, before preparing the tender for the vehicles the broadcaster evaluated several different consoles. Studer’s Configuration Editor Software has been installed on RTV’s Vista 5s enabling almost any console structure required by the operator to be adopted. This optional tool allows the user to specify the number of channels, buses and processing within the channels, as well as signal flow possibilities within the console. Typical broadcast facilities are included, such as N-1 outputs, off-air conferencing, GPIO and extensive monitoring, including 5.1-to-stereo downmix functions. The console’s internal matrix may be controlled from a variety of third-party controllers and video routers, eliminating the requirement for external audio routers in many installations. TSE were also responsible for the design of the OB vehicles themselves — which are based on the Mercedes-Benz Atego chassis. All coach building, HVAC, acoustic fit-out and installation of all AV technology was undertaken locally in Slovenia. The OB truck is also the first within RTV’s fleet to be equipped with a 5.1 speaker monitoring system. In fact the portability and simple connectivity of this flexible compact digital mixer, make the Vista 5 particularly suitable for OB vans. 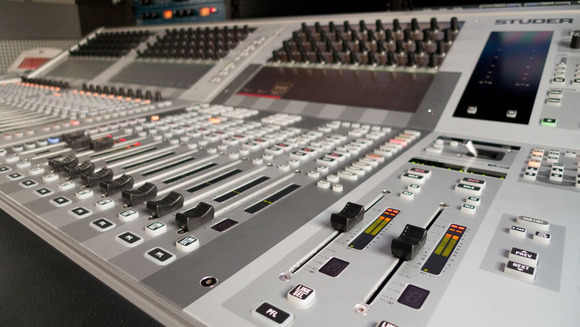 The 32-fader desk consists of 20 channel strips, optimised for input channel operation, and 12 additional versatile strips for operating output and input channels. By using the standard Vistonics™ screen, up to 52 outputs are under immediate control. A total of up to 240 channels can be accessed from the desk and laid out in any order, with the Vistonics system giving instant control over all related channel functions. Additionally, extensive diagnostics are available to indicate system health. Besides standard redundancy such as RAID hard-drives, there are several hardware redundancy options available, including Power Supplies, DSP cards with instant switch over as well as redundant link to DSP core and MADI links to D21m remote I/O boxes. The Vista 5 offers extensive surround capabilities a user can normally only dream of. Formats include 2CH stereo, LCR, LCRS and 5.1. The internal 5.1-to-stereo downmix function allows for simultaneous live productions in both formats. The Vista 5 also includes Studer’s ‘Virtual Surround Panning’ (VSPTM), using not only amplitude, but also time delay and frequency response panning as well as artificially-generated early reflections for realistic placement of sound sources. The static automation (snapshot filtering and editing) as well as the cue list functionality, (plus mute groups and matrix busses), makes Vista 5 equally well-suited to any live sound application. In common with all the latest products from the Harman Pro Group, the Vista 5 is HiQnetTM-compatible, and is able to take its place in a networked sound system with wireless microphones, signal processing, amplifiers and loudspeakers. RTV Slovenia is a public, non-profit radio-television organisation rendering public service in the field of radio, television and other activities. It has a strong platform for covering national culture, the arts and entertainment. RTV Slovenia broadcasts from two national television networks (TV SLO 1 and TV SLO 2), two regional networks (Television Koper/Capodistria and Tele M), one each for the Italian and Hungarian national community each, three national radio programmes (First Programme, Second Programme - Val 202 and Third Programme - Programme Ars), two regional radio programmes (Radio Koper and Radio Maribor), a radio programme for foreign audiences (Radio Slovenia International). RTV Slovenia also includes Radio Capodistria and Pomursko madžarski radio/Muravidéki Magyar Rádió with programmes for the Italian and Hungarian national communities in Slovenia. It handles radio and television broadcasts for the Romany ethnic community, radio and television programmes for Slovene national minorities in the neighbouring countries as well as for Slovene emigrants and migrant workers. it also has a special national television programme intended for live broadcasts and broadcasting of recordings of sessions from the National Assembly of the Republic of Slovenia and its working bodies (TV SLO 3). The Public Service Broadcaster is financed from several sources, namely the RTV licence fee, commercial revenues, marketing activities, the finance attributed from the state budget, sponsors and other sources. Among its other activities, RTV Slovenia hosts choirs and orchestras, has its own Multimedia Centre (including RTV’s Internet and Teletext services) and runs its own record label (RTV Slovenia) to promote culture and the arts.